Featuring a large sun room and walking distance to the beach! Special Amenities: open layout, Wi-Fi,, large rear sun room with floor to ceiling windows, propane fireplace, loft, walk to North Beach, basketball and playground. Welcome to the Lake Region of the Poconos! This beautiful vacation home is located in the four star premier resort community, the Hideout. 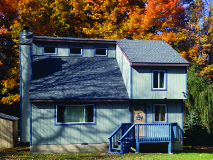 This cozy Pocono home features 3 bedrooms, loft and 2 bathrooms. This cottage features a spacious living room and cozy propane fireplace. Sit back and relax on the large rear enclosed sun room under the stars. The main floor of the house has a living room with a propane fireplace, the dining area and kitchen. Off the dining area is the large sunroom with floor to ceiling windows. There is no better place to relax and enjoy the beautiful woods that the Poconos offer! This is a great open floor plan for entertaining! Enjoy vaulted ceilings. The main level has the master bedroom with Queen bed and connected full bath. The laundry is off the kitchen as well. The second floor features two additional bedrooms and 1 bath. The first bedroom has a twin and cozy oversized chair. The other bedroom has a queen sized bed. There is also a loft on the second floor with large TV and futon or extra sleeping for 2. Enjoy the large rear sunroom and serene landscapes the Poconos offer! The Hideout Beach is walking distance about 1/10 of a mile away! At that location you can fish, bbq, playgrounds, basketball and much more! There are terrific community amenities and area attractions. 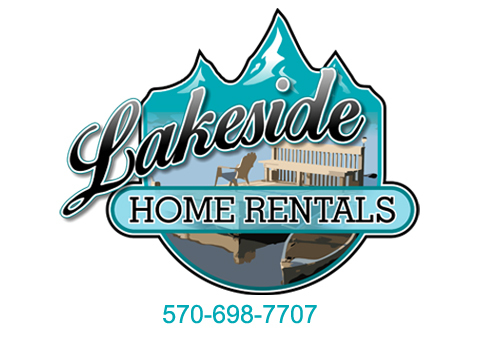 Click on the links above or below for additional vacation information to help you plan your get-away to the Poconos. Plan your vacation and reserve this home today!